Being comfortable and safe in public spaces is a right that all individuals should have but, sadly, that is not the reality. 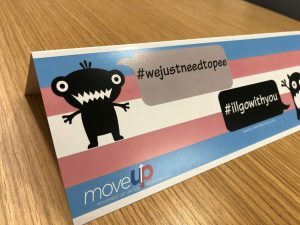 Every day transgender, non-binary, and gender non-conforming people face difficulties accessing safe toilet facilities because they are insulted, harassed and even assaulted when they try. Our union’s commitment to fostering safe environments and fighting for fair treatment for all extends beyond just the workplace. On behalf of the Human Rights & Multicultural Committee we would like to officially launch our #IllGoWithYou campaign. #IllGoWithYou is a campaign to create safe spaces for transgender and non-binary* people. This is part of an international movement in support of the LGBTQ2S+ communities. While some members of the community can “appear as” cisgender** enough to avoid confrontation in gendered-segregated spaces (such as washrooms and change rooms), not all can, want to, or are confident that they will be safe. This is just one of the many challenges the transgender, genderqueer, and other gender-nonconforming people face each day. No one should ever feel unsafe using a restroom or any other gendered spaces. First of all, be the change you want to see in the world. If you see someone being bullied for their gender expression or identity, speak up, help them get out, or get help. Next wear an #IllGoWithYou button or place one of the tent cards on your desk or cubical. By doing so you are accepting responsibility to act, get up and go with people who have trouble accessing a bathroom when they ask for your support. You are their ally. Let’s say you have a #IllGoWithYou button on your bag or coat. You’re out somewhere–school, a bar, a library, anywhere–and a person approaches you. They say “I see you have an I’ll Go With You button. Would you mind coming with me to the restroom?” And then you go with them. Please contact Joanne to request buttons and tent cards for your workplace. * Non-binary community – A person who does not identify to a particular gender. ** Cisgender – A person who identifies with the gender assigned at birth.